Once again, the annual Faculty Show at the Currier Museum of Art in Manchester, NH is going on. I usually try to make something a little bit different. 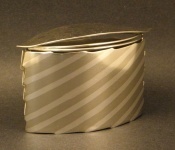 Over a year ago, I tried to make a second box with the silver stripe on nickel pattern, but the lid wasn't gelling, so that got put away for a while. This time, I thought, try again and simplify the lid, which I did, and it worked out well. Box is called Sailing Through Time. I am fascinated by time and space, so I try to work in a time or space theme in some of my more adventurous work. It is about 4" long, 3.5 tall and about a little over an inch wide. I don't make conventional boxes, but that defy all boxmaking logic. I get a little over the top at times. I had to do a rush job just before Christmas, making a pair of earrings per client's specs ( try to translate a crude drawing into a nice piece of jewelry is half the challenge). After I was done, I was inspired to do open pod shapes in wire, but have them move freely on earrings or necklaces, so my Bud earrings were my first finished attempt. I used these golden-orange beads that seems to glow, so that earrings seem almost magical and yet regal. 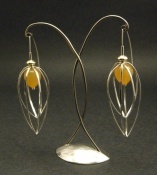 I'll be working more in the open pod format, and hope to have a number of earrings and necklaces this summer. I try to photograph my work as much as possible, for records, and for PR such as Facebook, marketing and more. The current trend in photography is a pure white background, so that artwork seems to "float". I did get a lightbox for that, as well as keeping my old grey/black backdrop. However, as you can see from the images above, the white lightbox seems to "flatten" out the work, taking the life out of it. On the other hand, when I use my gray/black backdrop, my work seems livelier. I still prefer to use a dark backdrop for it makes silver pop out more, while a white background makes silver fade out. Gold looks better against white, rather than silver. It was an interesting observation I noticed when I was editing my images.